Citation: C N Trueman "Henry VIII – a description"
The following is a description of Henry VIII. It comes from a Venetian diplomat called Pasqualigo who wrote it in 1515 in a dispatch back to Venice. 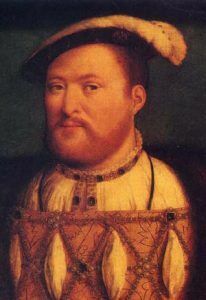 An English politician potentially faced the loss of everything if he made any disparaging remarks against Henry VIII, especially over the king’s appearance, which Henry took very seriously. . Pasqualigo was free from the threat of any such comeback. Therefore, it is quite possible that this is a true description of Henry VIII as opposed to the sycophantic ones invariable written by Englsihmen. “His Majesty is the handsomest potentate I ever set eyes on; above the usual height, with an extremely fine calf to his leg, his complexion very fair and bright, with auburn hair combed straight and short, in the French fashion, and a round face so very beautiful, that it would become a pretty woman, his throat being rather long and thick. He was born on the 28th of June, 1491, so he will enter his twenty-fifth year the month after next. He speaks French English, and Latin, and a little Italian, he plays well on the lute and harpsichord, sings from book at sight, draws the bow with greater strength than any man in England, and jousts marvellously. Believe me, he is in every respect a most accomplished Prince; and I, who have now seen all the sovereigns in Christendom, and last of all these two of France and England in such great state, might well rest content, and with sufficient reason have it said to me, ‘abi viator, sat tuis oculis debe’ (go home traveller, your eyes have seen enough).